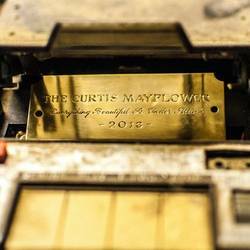 The first studio release from The Curtis Mayflower titled Everything Beautiful Is Under Attack is a combination of talent, great songwriting, and beautiful haunting melodies. This is what happens when you take five of the best musicians from the Central Massachusetts area and send them up to an old farmhouse in Maine to record an album in 24 hours. Done mostly in one take the album is a compilation of lush sounds and hard driving bluesy rock that defies putting this band into a genre. The band is made up of Craig Rawding (lead vocals, harmonica),Duncan Arsenault (drums, percussion),Jeremy Moses Curtis (bass, backing vocals), Brooks Milgate (keyboards, accordion, acoustic guitar, backing vocals) and Pete Aleksi (guitar, backing vocals). The album opens with the tune "Clockwork Hearts" a rocker that starts off with haunting piano melody that sets the tone for the song, then the vocals and guitar come crashing in with Rawding asking " What makes you tick, darling? What makes you sick, darling? Clockwork hearts have broken parts but there’s a fix, darling". This song is a great lead in to the record as it shows the range of the band musically and vocally. "Crawl No More" is a straight up blues rocker reminiscent of some of the 70's Allman Brothers Band work, the roar of the guitars, drums and the keyboards complete the song. Vocally this tune covers it all with Craig at his howling best with lines like "Ain't going to crawl no more, go find another dog". The song "Last Kiss" is one of my favorite cuts on the record, a tune that sounds and feels like a long lost Otis Redding song. A truly soulful experience "She kissed me for the last time here where I lay, you know I ain't moving out, since she said goodbye, I wish I could cry....." this song relies on vocal emotion and Craig delivers it. The backing music provides the strong foundation but doesn't distract the listener from the emotional power in his voice. "Punchline" is another bluesy tune with lyrics like "Laughed so hard I cried laughed so hard I choked, don't even know why I'm laughing, when I'm the punch line to the joke", this song really peaks out with guitarist Pete Aleksi's style and tone ripping away at the end of the song. "Paraselene" starts with some lush beautiful sounding keyboard noodling from Brooks Milgate until Curtis' bass line creeps in followed by Rawding's raspy vocals completing the dreamy feel of this song. Lyrically this song has it all "Nothing is for certain and the moon is split in two and I wonder if the sky above me is darkest over you or did you find the bright side of the moon" and "the band is up for homicide they've murdered Claire de Lune, don't turn on the sun while everyone's hiding their wounds and looking for the bright side of the moon. This song is chock full of metaphors and represents how each member, while great solo really come together and compliment each others style. "Carry Your Burden" starts off sounding like an old Southern blues song with harmonica and acoustic guitar lasting for about 20 seconds when the guitars and keys bring it up to a full blown rocker reminiscent of Savoy Brown meets The Allman Brothers Band. "Seven Children" is one that brings out the guitar tone of Aleksi, sounding more like Clapton and Cream and Rawding evoking memories of Jack Bruce this is another tune that showcases the cohesive sound of the band at their finest. "Ben The Destroyer" is another song that, make no mistake about it proves these guys have some rock chops in them. A great rock and roll tune with the driving backbeat reminiscent of The Smitereens provided by Arsenault and Curtis, next to a fuzzed out guitar sound teamed with Milgates keyboards, "Ben is a snake who swallows his own tail". "Cold And Dark" and "NYCD" are two songs that bring the bands past musical experiences to play, blues chops galore and each song shows that the band can kick the standard blues up a notch. The record closer is the tune "The Devil Wants To Get Paid" that starts out proclaiming "Hells on fire I've been told, but it feels to me mighty cold" from here the song just swells and states "Your wicked spell has lost its charm, can't do no good, can't do no harm, you had your day and now the devil wants to get paid". Another rocker filled with lyrical imagery and lush keyboards a signature for this album. A great record that delivers from the first song to the last, highly recommended. Posted Feb. 17, 2014, 8:54 p.m.